I was walking through Sam’s Club this week in preparation for New Year’s Eve. Immediately catching my eye were the enormous bottles of wine – what I’ve since come to learn are called Magnum bottles (holding 1.5 L, or the equivalency of double a common size bottle). 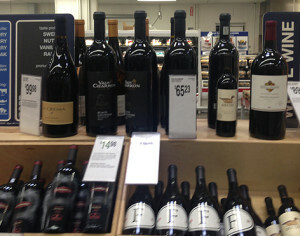 While my first reaction was, “You better be serving a lot of people if that’s the size bottle you purchase,” it then dawned on me that the size of the bottle had less to do with the quantity of wine, and more to do with capturing my attention. It was meant to disrupt my thought process and make me notice that product. And I must say, it worked! The 1.5 Liter bottles on the top draw you right into the standard size bottles beneath them. The club store environment is different from any other retail setting. Pallets of products in secondary packaging boxes are the norm. Physically, instead of simple shelves, the stores are strewn with large racks. Signage is very minimalistic. As these wine sellers realized, one way to improve their chances of being and staying noticed is to maximize their product’s packaging. In the club store environment, a product’s packaging can make or break your success. Great packaging is directly attributable to greater sales, and conversely poor packaging can sink your product’s ship. Deliver: your packaging needs to deliver your product in a self-contained display that is retail ready. Disrupt: your packaging must disrupt the consumer, stopping them in their tracks. Describe: your packaging must describe exactly what your product is and why the consumer should want it. Delight: your packaging needs to delight the consumer with optimal functionality and features that reinforce the quality/value message of your product. If you fail to succeed with any of these “4 Ds” you will risk missing out on this market. Warehouse club stores are amongst the fastest growing of all general merchandise retailers. But like most opportunities with a great upside, it also has a downside. Space is very limited and product success/failure is typically judged swiftly. If your brand doesn’t perform well out of the gate, you can find yourself getting booted off the shelf (or in this case, rack) very quickly. And unfortunately that failure is often not the result of the quality of the product itself. As the saying goes, you don’t get a second chance to make a first impression, and unfortunately, that’s true in the club store setting. We invite you to learn more about how to make that first impression one that counts, with our white paper 4-D – Designing for packaging for the club store environment.